Earn $2.30 in VIP credit (230 points)What's This? 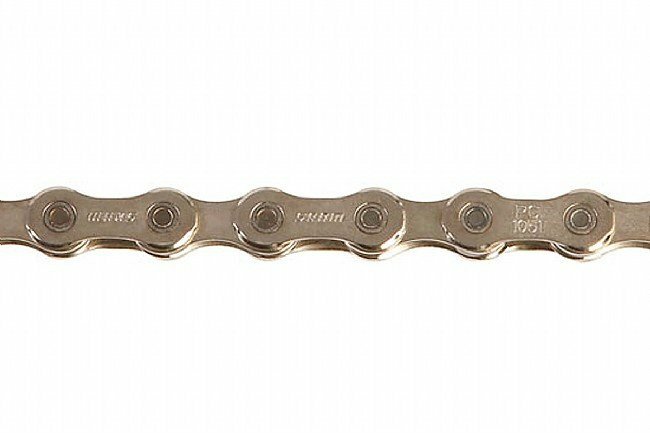 The SRAM PC-1051 chain features a slight re-shaping of the outer plates to run more quietly than the previous PC-1050 chain. Nickel plating is used on the outer and inner plates to resist corrosion. Solid chrome hardened pins. Includes tool-free PowerLock connector link. 271 grams (114 links). Note: SRAM suggests that a new PowerLock connector be used each time the chain is broken and re-connected. I'm averaging 9500 miles a year and burn through drivetrains. I've found these chains perform the best. I have been using this chain with my Ultegra 6700 drivetrain. I find the SRAM chain quieter and better lasting than the Shimano chains. This chain works great for my 10 speed Specialized road bike. No issues. I like the shinny finished... it helps me to keep the chain clean. The SRAM PC-1051 chain last longer then most chains for half the price. The quick link works great and the chain is light and durable, lasting about 1000 miles more than most chains. Main chain to train, price not insane. Great chain for training in the Pacific Northwest. Durable, not insanely heavy and easy to put on. It also lasts a full winter in the muck! The Scram PC -1051 came as standard OEM equioment on my Focus bike. I rode over 2,500 miles on the original chain and replaced it with the same model. I use Scram chains on all my bikes, & believe that they last longer & work better than Shimano. The Sram chain was very easy to put on my bicycle and it is because of the link that comes with the chain. It connects my sprockets to my cassette and makes the wheel go around. Works as expected and seems like a quality chain after 200 miles. I really like the way the Sram chains hold up and never rush even in wet, freezing temperatures. I ride 6000 miles a year and two of Sram's chains is all I need...I really appreciate their durablity. I just replaced my 10 speed chain on Pugsley fat bike. In doing the install, I love Sram's coupling link to easily close the gap between ends of chain. Overall, a chain isn't that glamours or exciting unless it's not working and presented problems like my old one with chain stretch and jumping gears. Subsequently, I am happy to report that I am shifting and pedaling without thinking about my chain. Gotta wonder why the connecting link is a one-time use only. I usually run my road chains 600-700 miles (homebrew lubing every ride), break chain & bathe in solvent & clean cassette, chainrings. By doing this, you can get more mileage out of your chain, cassette & chainrings. Guess I'll buy an aftermarket re-useable connecting link (Connex, etc.) after the 1st bath. Sram chains run great!!! Who cares if the link is hard to get off. The only time you need to take a chain off is to replace it. Do what the pro's do. Or if you can't figure out how to clean your chain on the bike get the park tool MLP-1. I also like this chain for the value. I will stretch out a chain before it sits long enough to rust, so I save money with the 1051 while still having a smooth chain. Whats the purpose of the power link if getting the chain apart requires a special tool? Wipperman link allows you to easily take chain on & off for cleaning. Not so with the Scram link. This is my last sram chain unless they change the design.